An exception is an anomalous or unexpected situation in a flow that requires special steps to handle it. In other words, it usually means something went wrong in your flow. Using e xception handling is a way to anticipate errors and manage them effectively. Think of exception handling as a safety net for your flows - it can save information or alert the user that something is wrong. Exception handling is important for maintaining a good experience for users who use your flow. The Decisions platform provides two ways to handle exceptions: an outcome path called On Exception	which catches exceptions from a given step, and a step called Catch Exception	which can handle any exception that happens in a given flow. The On Exception	outcome path can be activated by selecting the Add Outcome for Exception	checkbox in the Properties	panel of a given step. The Catch Exception	step can be activated by dragging it onto the workspace from the Steps	tab on the right in the Flow Designer. To guarantee an exception, we&apos;ve intentionally set the mapping type of the From	property to "Ignore." Instead of failing whenever Send Mail 1	produces an exception, direct the flow to a second End Step	. In a production scenario, we would direct our flow through more complex steps to display our errors or create logs entries from them. But for simplicity in our example, we will simply end the flow. Locate the End	step component in the Toolbox	panel, under the category Flow Management	. To distinguish it from the End Step	that already exists, name it "No Error." 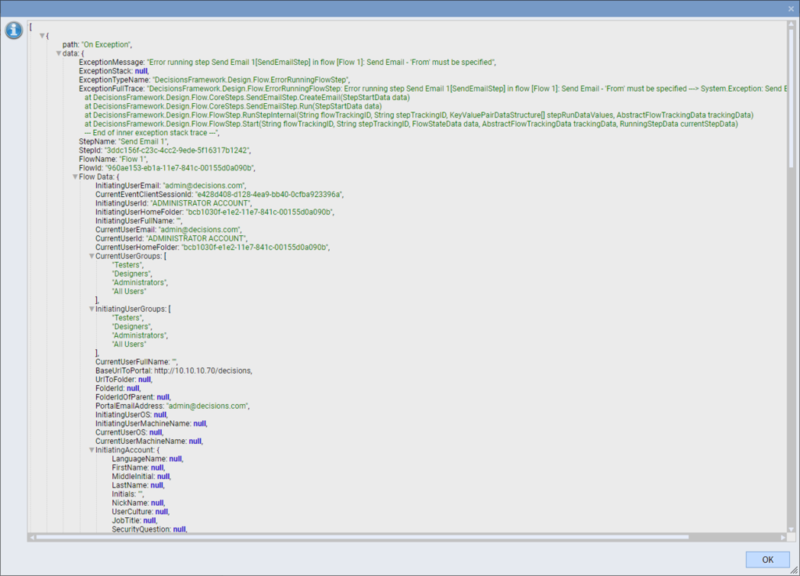 Next, configure our flow to go to No Error	whenever Send Mail 1	produces an exception. To do this, select Send Mail 1	and, in the Properties	panel, select the Add Outcome for Exception	checkbox under the Outcomes	section. Now, that Send Mail 1	has a path for On Exception	, connect it to No Error	. When we run our flow in the debugger, the exception produced by Send Mail 1	causes our flow to follow the On Exception	path and finish at No Error	. Because we&apos;ve handled the exception that Send Mail 1	produced, our flow reports no errors. For simple flows, On Exception	paths are a quick and simple solution to the problem of exception handling. When flows become large or complex, however, the number of On Exception	paths required can complicate design and make changes difficult. To alleviate this problem, the Catch Exception	component listens to all of the steps in a flow and handles their exceptions in a uniform manner. 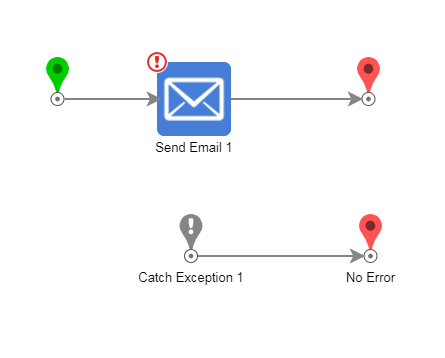 Begin implementing the Catch Exception	component by removing the On Exception	path connecting Send Mail 1	to No Error	. Click on the Send Email 1	step, and uncheck the Add Outcome for Exception	checkbox in the Properties	panel. This saves our flow from reporting a validation error and is the last step before saving and testing our flow in the debugger. Next, drag Catch Exception	to our workspace. It can be found in the Toolbox	panel, under the category Flow Management	. Catch Exception 1	has a single outcome - On Exception	- to connect to No Error	. In the debugger, we can see that the exception produced by Send Mail 1	is caught by Catch Exception 1	, despite there being no path drawn between them. With this arrangement, our flow could have as many steps as we wanted. Every exception thrown would be caught by Catch Exception 1	and handled in the same manner (see the production scenario example below). Additionally, in the debugger if we click Catch	Exception	> View Output Data,	we canview the precise details of the exception that occurred. These details can be displayed or logged with additional steps discussed elsewhere. It is best practice to include at a minimum, a Catch Exception	step, and a form to show to a user that says an error has occurred. (This assumes a flow that has user interaction.) The Error Handling Flow	below is a Start Linked Flow Async	step. This type of step simply initiates another flow (in this case, a standard error handling flow that tasks an administrator to look into the error), but does not wait for that flow to complete. The process moves on to the End	step regardless of the status of the Error Handling flow. It is also best practice to use this type of flow linking so the parent "calling" process does not keep running.